These are the Hawaii state shipping regulations, limitations, rules and laws for the trucking of oversize and over weight loads over the roads and highways in the state of Hawaii. 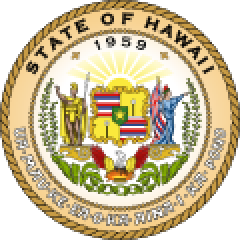 The great state of Hawaii official seal. Length: No overall limits on length. Gross Weight: Depends on proposed routing. Contact Hawaii DOT for more info. 1/2 hour before sunrise to 1/2 hour after sunset rule applies. The information contained in these pages is research information primarily for use by oversize and overweight trucking company drivers, dispatchers and pilot car companies. While every effort is put into maintaining the accuracy of this information you must absolutely verify this information with the Hawaii State DOT Permits office before commencing movement. Depending on the routing and which island just a permit. are any special licensing or registration required? This is a great idea as I have personally spent time in the islands and is a service that is needed. The dimensions you mention are legal but it’s always good to talk with the DOT and even develop a relationship with them in Maui. Click here for more info.